What do arts and jewellery share in common? Essentially, a great piece of jewellery is a work of art created with master craftsmanship and rare stones. Bvlgari’s artistic approach to jewellery has been adored by many iconic figures, most notably Andy Warhol, an admirer of Bvlgari’s creations who once described the brand’s jewellery as “the 80s”—a statement that has inspired Bvlgari to craft the Wild Pop High Jewellery collection that celebrates the roaring era three decades later. Taking inspiration from all things extravagant in the 80s, from bold fashion icons, the debut of MTV and the rise of Madonna, Michael Jackson, Prince and David Bowie, to groundbreaking artists like Andy Warhol, Jean-Michel Basquiat and Keith Haring, Bvlgari Wild Pop is a rule-breaking collection characterised by futuristic geometries and vibrant colours. Expect the unexpected with Bvlgari’s cutting-edge designs in the collection, combining the maison’s time-honoured craftsmanship, rare gemstones and dramatic colour juxtapositions. A celebration of Bvlgari’s long-standing love affair with New York City, Supreme Diamond Light bracelet, earrings and ring are designed to resemble the striking Manhattan skyline with the contrast of black onyx and white diamond, set with a marquise-cut diamond. Another showstopper is the Magnificent Green Ruffles necklace, a statement piece inspired by a quote from Alexis Carrington in the 1980s TV series “Dynasty”, who said "When in doubt, add some ruffles to your dress. 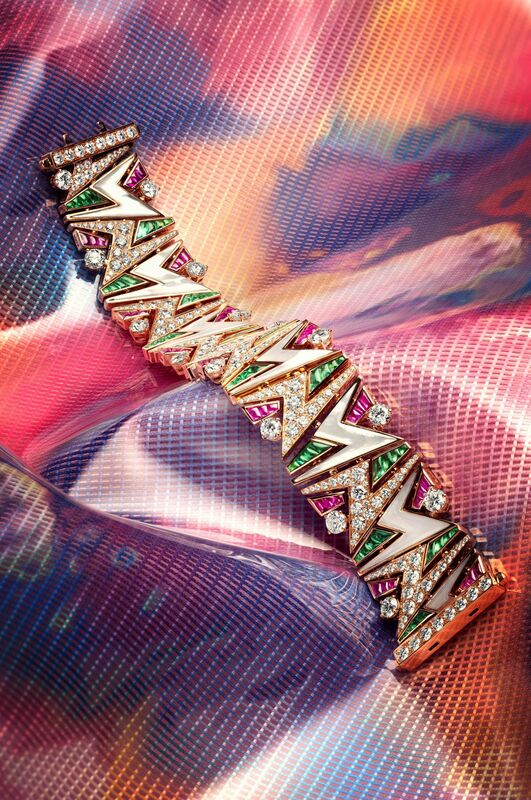 "— a piece of retro fashion advice Bvlgari has taken to heart and elevated with rose gold ruffles set with amethysts, turquoises, pave diamonds and 11 Zambian emerald drops. Putting a spotlight on symbolic elements of the 80s, the Wild Pop collection also reinterprets the microphones and synthesizers prevalent in music videos on MTV to create the Synthesizer necklace, featuring a keyboard crafted in onyx and diamonds that plays homage to a revolutionary era in the world of music. The design of the playful, provocative Pop Mics necklace, bracelet, and brooch also takes reference from the soundtracks of the 1980s, distinctively set with colourful microphone tops formed by smooth cuts of aquamarines, amethysts, peridots, green tourmalines and rubellites. Arguably the most daring creation in the Wild Pop collection, the Happy Leaves necklace is perhaps the first high jewellery piece devoted to cannabis, inspired by movies from the 80s including “Desperately Seeking Susan” and “Fast Times at Ridgemont High” where the herb symbolises dreams of escapism. The marijuana leaves are composed of precious yellow gold, framed by pave diamonds—a truly irreverent jewel that lures the wearer with its magical effects. Playful, delicate and out-of-the-ordinary, Wild Pop collection is Bvlgari’s most daring high jewellery collection to date that glorifies a bygone era with timeless pieces.